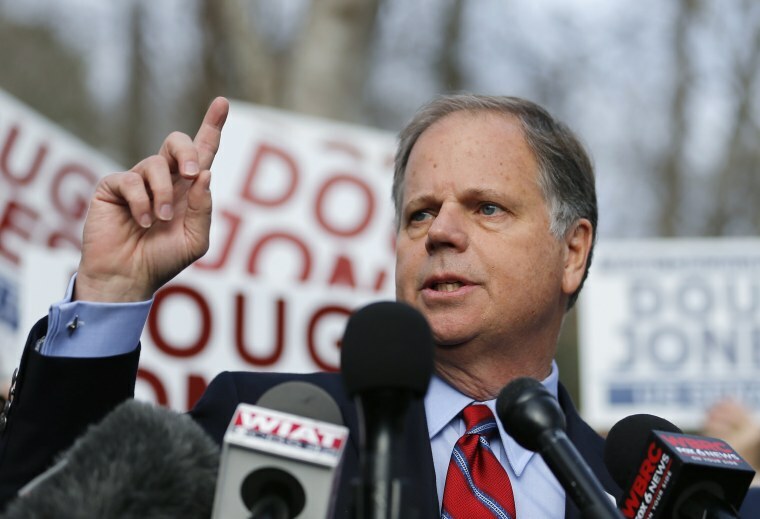 Doug Jones' projected victory caused Democrats to celebrate in Alabama with an outpouring of congratulations to the women who came forward with accusations of sexual misconduct against Roy Moore, while Republicans blasted President Donald Trump and Steve Bannon for supporting the GOP candidate. Moments after the race was called for Jones, a deluge of Democrats, including Senate Minority Leader Chuck Schumer, D-N.Y., Hillary Clinton and Sen. Tim Kaine, D-Va., took to Twitter to offer their praise for the victor and to commend the women who went public. "Doug Jones will be an outstanding Senator who will represent Alabama well. He was a great candidate and will be an even better Senator," Schumer said. "Roy Moore was an awful candidate and never should have gotten to the Senate. But make no mistake about it, just like in Virginia, Democrats are energized, focused on the middle class and those struggling to get there, and things are looking better and better for 2018." Schumer's colleague from New York, Sen. Kirsten Gillibrand, tweeted that Jones' win was "a victory for showing up, fighting to the end, and standing for what’s right." Other senators not-so-subtly lauded Alabama voters for rejecting Moore due to the allegations made against him, which he has denied. "Congratulations to my friend @GDouglasJones. He'll be a great colleague. President Trump went all in for Roy Moore, but proud Alabamians wisely repudiated their behavior," Kaine tweeted. Sen. Sherrod Brown posted that he was "grateful to the women who had the courage to come forward." "Because of them and so many others like them, we are seeing meaningful change. I look forward to finding opportunities to work with Doug Jones in the Senate to support middle-class families," Brown added. Clinton, for her part, said, "Alabama voters elected a senator who'll make them proud." "And if Democrats can win in Alabama, we can — and must — compete everywhere. Onward!" she tweeted. Jones' win will leave the GOP with just a one-seat majority after Jones is sworn in and is likely to impact negotiations surrounding 2018 spending deals, the GOP tax plan, funding of the Children’s Health Insurance Program (CHIP) and a deal to protect DACA recipients. Republicans — particularly those who did not support Moore — further criticized the losing GOP candidate Tuesday night and praised the voters in their party who'd turned their backs on the man who’d, for weeks, been dogged by allegations of sexual misconduct with teenage girls decades ago. Sen. Jeff Flake, R-Ariz., who donated to Jones' campaign, tweeted "Decency wins." "Thankfully, today enough Republicans choose country over party. Tomorrow we must redouble our efforts to support candidates worthy of the office they seek. #TwoPaths,” Ohio Gov. John Kasich tweeted. Sen. Cory Gardner, R-Colo., the chairman of the National Republican Senate Committee, said in a statement that "the people of Alabama deemed Roy Moore unfit to serve in the U.S. Senate." Gardner had previously said that if Moore had won, the Senate should vote to expel him. The Senate Leadership Fund, a nonprofit aligned with Senate Majority Leader Mitch McConnell, R-Ky., explicitly pinned the GOP's loss on Bannon and Trump for supporting a flawed candidate. "This is a brutal reminder that candidate quality matters regardless of where you are running," SLF President and CEO Steven Law said. "Not only did Steve Bannon cost us a critical Senate seat in one of the most Republican states in the country, but he also dragged the President of the United States into his fiasco," Law added. Trump had endorsed Moore in the race, while Bannon's support for the candidate dated back to the GOP primary against Sen. Luther Strange. Bannon was even scheduled to speak at Moore’s election night rally, a Moore campaign official told NBC News.